“May you find the place where your deep gladness and the world’s deep need meet.” Each confirmation student held the bowl of water, and traced the sign of the cross on forehead or hand, as, together, we said spoke this blessing based on the words of Frederick Buechner. Our deep gladness. The world’s deep need. It is an intersection, a cross. The center of this intersection is purpose, call, vocation. That day in class, we read biblical call stories, shared dream careers, chewed over the idea that sometimes vocation is not the same thing as our work and that our sense of call may change in the course of our lives. Jesus breaks the surface of the water. Feet in the mud of the Jordan. Eyes drawn toward the broken heavens and the alighting spirit-dove. This is the moment that catches me. It is an intersection, a cross. In the body of Jesus, water meets sky, earth meets heaven, flesh meets spirit, sin meets belovedness. Sin. Did I say the word? I know sin’s not popular. I know it has been used to abuse some of us. I know talking about it may seem to drain all the joy out of faith. Indeed, sin makes lots of people uncomfortable. The whole idea that Jesus would go to John for baptism – the purpose of which was repentance and forgiveness of sin— has initiated centuries of controversy. In Matthew, a flabbergasted John exclaims to Jesus: “I need to be baptized by you, and do you come to me?’ And Jesus replies:‘Let it be so now; for it is proper for us in this way to fulfill all righteousness.’ In other words, Matthew is trying to assure us that Jesus doesn’t really need this Baptism; it’s just something he’s doing to meet expectations. This week we observe the year anniversary of the earthquake in Haiti. I recently discovered the Haitian-American writer Edwidge Danticat (Ed-WEEDJ Dan-tih-CAH), and her Feb 1, 2010 essay in the New Yorker. At the end of the essay, she describes her first phone contact with relatives in Haiti in the aftermath of the quake: Everyone sounded eerily calm on the phone. No one was screaming. No one was crying. No one said “Why me?” or “We’re cursed.” Even as the aftershocks kept coming, they’d say, “The ground is shaking again,” as though this had become a normal occurrence. They inquired about family members outside Haiti: an elderly relative, a baby, my one-year-old daughter. I cried and apologized. “I’m sorry I can’t be with you,” I said. “If not for the baby—” My nearly six-foot-tall twenty-two-year-old cousin— the beauty queen we nicknamed Naomi Campbell— who says that she is hungry and has been sleeping in bushes with dead bodies nearby, stops me. “Don’t cry,” she says. “That’s life.” “No, it’s not life,” I say. “Or it should not be.” “It is,” she insists. “That’s what it is. And life, like death, lasts only yon ti moman.” Only a little while. With apologies to Matthew, I’m afraid that a “sinless” Jesus doesn’t make sense to me, doesn’t matter to me, doesn’t help me. To be human is to live in a world shaped by sin. The Haiti earthquake is life, though it should not be. The haitian history of enslavement and brutal dictators and crushing poverty, and the relative indifference of those of us who live in comfort, is life, though it should not be. I need a Jesus who knows what it is to be complicit in the pains and struggles of this world that is not as it should be, who knows what it feels like to be separated from God, and alienated from ourselves and our neighbors. To be human is be involved in sin. From moment to moment, in our limitation and fragility, we fail to live up to our own most cherished values… but this is only part of the story. Jesus places his feet in the muck of the river. He entrusts himself to the arms of John the Baptist and the arms of God. He falls back into that muddy stream, making himself vulnerable to the near-drowning experience of being human. Then he breaks the surface of the water. He sees the broken heavens and the spirit-dove alighting He hears the voice of the divine naming him beloved. Baptism is not so much an obliterating of sin as it is the intersection of sin with belovedness. This intersection is the place of incarnation, the place where God is made flesh. At this intersection, wondrous things happen. In our vulnerability to the waters of God, our humanity is made whole: not perfect, but complete. Our Creator affirms an even deeper and greater truth that our sin: We are God’s beloved. We are God’s children. God is pleased with us. The spirit brushes near and anoints our lives with purpose and hope. Newness trickles forth from our faces and beads down our shoulders. We are prepared, equipped, commissioned. 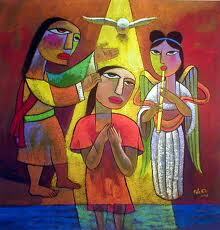 Baptism is also our beginning point, our launching and commissioning. It can something we daily remember, celebrate, and seek to live. Showering in the morning, drinking a glass of water, washing the dishes, driving over Mississippi: these small acts can become rituals that connect us to the waters of life and the promises of the font: We are beloved. We are God’s children. God is pleased with us. Last year, on this same Sunday of the church year, I came to First Church as a candidate. Some of you have heard this story … the night before, both my partner and I came down with an awful stomach flu or something. I’ve hardly ever been so sick in my life. But we came, what else could we do at that point? Somehow Abby and I led worship and I preached a sermon. As I waited to hear the results of your vote, I nibbled the corner of a saltine and drank a sip of tea. You called me to be your pastor. I went home and crawled in bed. It was quite a memorable day. I have been reflecting on the fact that we have been in ministry together for almost a year now. I am having a great time; I love this work. And I can honestly say that every day has been more pleasant than the first! During this first year, we have been getting acquainted … a process which is by no means finished. At the same time, we have been laying the ground work for a congregational visioning process. And now we are ready to begin! On the Day of Engagement (when is that?) we will learn and serve together in our community, then gather here to share a meal and reflect on the day. During January and February, we will also send individual First Churchers to meet one to one with various organizations and leaders in the community. Next week, we will begin the process of signing YOU up for our February small group listening sessions. In all our engaging and listening, may we break the surface. With feet planted firmly in mud and muck of our own sin and the struggles of this world, this world in which so much pain is life, though it should not be, may our eyes be drawn to broken heavens and an alighting spirit-dove. May we allow ourselves to be vulnerable to the waters of God, in which we discover our full humanity, our brokenness and our beauty. As the body of Christ in the world, may we find ourselves drawn toward the intersection, the cross, that is our purpose, our call: toward the meeting place of our own deep gladness and the world’s deep need. Friends, we are beloved. We are God’s children. God is pleased with us. Amen.